When I was a kid, my mom made the best banana bars ever. I remember the first time I helped her make the frosting and how I was totally convinced she was ruining them because she was browning, or in my young mind, burning the butter. When the frosting came together I was amazed at how delicious it was. I had expected it to taste like something my grandpa would like – he likes his toast black, and totally surprised by the nutty rich flavor the brown butter added to the frosting. It’s still one of my favorite frostings, and have even made a cream cheese version which is also really yummy. But I wanted a spiced version to use on all of my favorite fall treats and so here we are. 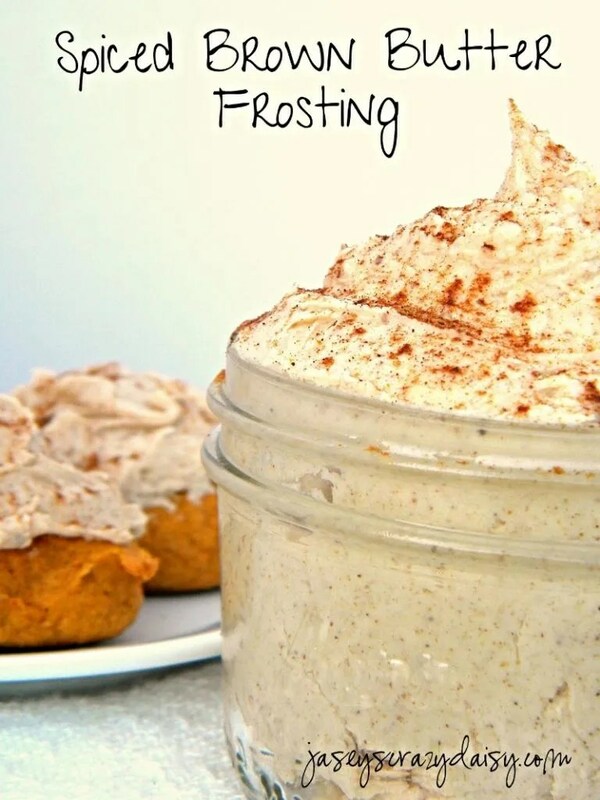 This frosting complements the cookies in the picture perfectly but would be terrific on lots of different cakes and cupcakes and I could see myself smearing a warm biscuit, toast, sliced bread, or even waffles and pancakes with it too. After all, it’s basically butter, right? Yep, pour a little syrup over it and I think I’d pretty much be in breakfast heaven. So go ahead and make a batch and use it for whatever your heart desires. I’m sure you have something in mind. And those cookies, stay tuned because they are next in line on the blog calendar. In a saucepan, melt two sticks of butter (leave the third out to soften) over medium low heat. When the butter is melted, pick up the pan and give it a swirl occasionally to check it's color. When it is golden brown and smells nutty, remove from heat and let cool completely. Once cooled, in a large mixing bowl, beat remaining stick of butter until it is creamy. Slowly add browned butter and beat until smooth. Stir in vanilla, pumpkin pie spice, cinnamon, ginger, nutmeg, and cloves. Gradually add powdered sugar, a little at a time until your desired consistency is reached. You can add a tablespoon of milk to thin the frosting a little if you want to. In this case, I wanted it thick and creamy so I could pile a nice scoop on top of my cookies. Store in an air tight container in the fridge until ready to frost. You may want to take it out to soften before spreading if you aren't using it right away. As always, enjoy! PS – It’s my grandparents anniversary today! Happy Anniversary Ma Carol and PaPa Al! I made the pumpkin cookies and used this frosting for my granddaughter’s 4-H club meeting. They disappeared in seconds. The kids said they were the best cookies they had ever had. Them I took the remaining frosting, a loaf of bread and a jar of peanutbutter to work. They made toast, used the frosting as butter with a little peanutbutter and it was gone in no time. I had to download the recipe for everyone at work. Thanks for such a great and easy recipe.